If you are one of those who face problem of Acidity in stomach or Gastric Acid Reflux then you must change your eating habits. In our last article we explained in detail how Acidity and Antacids are making you unhealthy. If you want to get relief from acidity by using some home remedies instead of using antacids then you are on the right page. Banana: Banana is a rich source of potassium and can easily check the acid production in your stomach. Basil Leaves: You may either eat holy basil leaves or you may boil 5-6 leaves in a cup of water and drink it as soon as it cools down. You may add some honey in it to sweeten it. Cinnamon: Cinnamon has antacid properties and its tea can greatly benefit in getting relief from acidity. Buttermilk: Buttermilk can easily sooth the effect of acidity. You may also add fenugreek seed powder, coriander leaves or black pepper to make it more effective. Apple Cider Vinegar: However its acidic in nature, but it can neutralize the acid due to its alkalizing effect. You may take 2 teaspoons of Apple Cider Vinegar after mixing it in a cup of water. Cloves: Sometimes acidity also happens due to low level of gastric acid in stomach. In such a case cloves can help. Just chew 3-4 cloves in your mouth and drink its juices released. 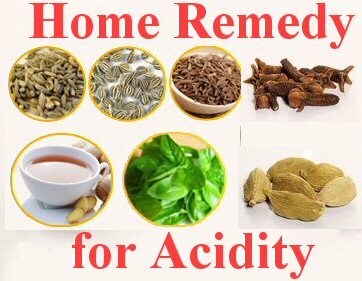 It will help in secretion of more HCl in your stomach, which may help you in getting relief from acidity. Cumin Seeds: Dry roast the cumin seeds and mix 1 teaspoon of its powder in a glass of water. It will act as a acid neutralizer. Home remedies are just a temporary solution to Stomach Acid (Gastric Acid Reflux). After treating it for temporary basis, you should do something for long term relief from acidity. That something is treating your lifestyle and eating habits. These lifestyle changes and eating habit changes don't need any special equipment but just need some time and your will to remain healthy. Have a regular diet pattern. Eating on right time is the key. Over cooked and precessed food should be avoided. More spicy and oily foods should be avoided. Chewing your food completely is another major change that you should do. Unchewed food is hard to digest and don't have enough saliva in it. Good Sleep pattern is also necessary. Say no to antacids as they are making you nutrient deficient and causing more disease. Instead of it use the home remedies listed above and do the necessary lifestyle changes.